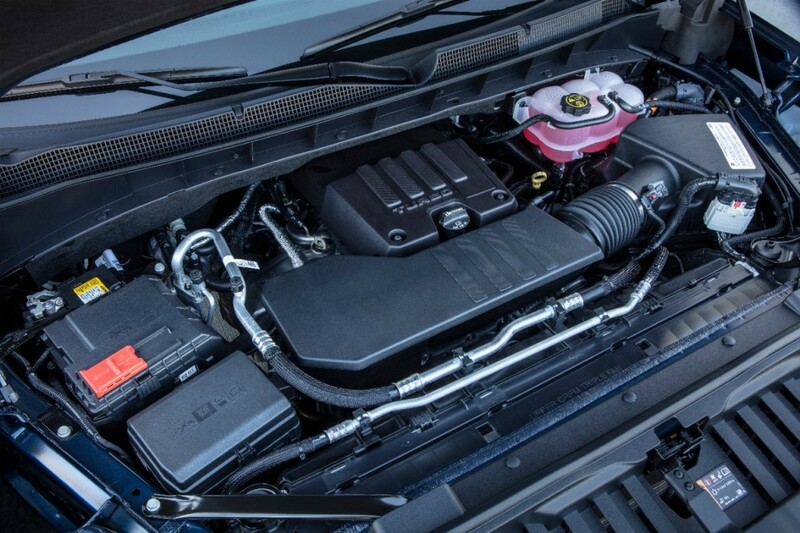 The 2.7-liter turbocharged four cylinder 2019 Chevrolet Silverado returned worse fuel economy than a similarly equipped 5.3-liter V8 model in a recent Car and Driver comparison test. For reference, the EPA fuel economy numbers for the 2.7L four cylinder Chevrolet Silverado is 20 mpg city and 23 mpg highway at most, while a 2019 Silverado 5.3L is expected to return at least 15 mpg city and 20 mpg highway (depending on which 5.3L V8 you get). But it’s important to know some details of this standardized fuel economy test. The publication conducts its own real-world highway fuel economy tests, which are run at a speed of 75 mph, much faster than than the EPA’s slow 48 mph test. This makes perfect sense to us, as consumers are more likely to travel at around 75 mph on the highway than 48 mph. Car and Driver noticed the 2.7-liter turbo four cylinder Chevrolet Silverado and 5.3-liter V8 Silverado returned similar EPA combined fuel economy figures (20 mpg and 18 mpg, respectively) so they decided to compare the two in its own 75 mph test. They didn’t have identical models on hand, instead comparing a 2.7-liter Silverado RST double cab vs 5.3-liter RST Crew Cab, which was 314 lbs heavier, but that didn’t seem to have much of an effect on the end result. The four cylinder Chevrolet Silverado averaged 18 mpg during the test, whereas the V8 model average 21 mpg, representing a difference of 28 percent. This isn’t that surprising of a result to anyone familiar with the ploy behind small turbocharged engines. These tiny displacement, forced induction motors perform well on the EPA tests, which are conducted at unrealistically low speeds, but at higher speeds when more boost is needed, the fuel economy falls off a cliff. This dip in fuel economy for turbocharged four cylinders under heavy load can also be observed when accelerating quickly from a stoplight, for example. Car and Driver conducted the same highway fuel economy test with a a 6.2-liter V8 equipped Sierra 1500 Denali with the eight-speed automatic transmission last year and observed an average of 18 mpg – the exact same as the four cylinder Chevrolet Silverado RST. The 450 hp Ford F-150 Raptor also returned the same 18 mpg figure. The only truck that did worse on the 75 mph highway loop test was the Toyota Tundra TRD Pro, which got 17 mpg. Someone at GM Authority needs to start checking the math before publishing., A three MPG difference does NOT represent a 28% difference over either 18 or 21 MPG. The three MPG improvement is 1/6, or 16.66% better.These are significant factors in the competitive performance and standing of a vehicle, so PLEASE do the math and check it for accuracy before publishing. These kinds of mistakes tarnish your credibility. Fuel milage being somewhat equal, I’ll take the under stressed V8 over the stressed Turbo 4 everyday. So what’s the point of this turbo I-4 motor? Why would anyone opt for it over a V8? I would rather just save my money and get the 4.3L V6 or opt for the 5.3L V8. In fact, this crappy I-4 is justification for expanding the models available with the V6. What a freekin’ joke. You cannot make this stuff up. If I did not know better, it would seem that GM was doing everything in its power to screw this launch up. it will along with the 1500 series diesel help with chevys corporate fuel mileage on the trucks since they go by the dyno test and chevy wants to put the 6.2 into more models which will hurt their average. I don’t doubt the 4 cylinder gets relatively poor fuel mileage, but it must be said that the longer bed on the double cab means more air on the tailgate which is more drag. This is why they have turned the CHMSL into a defacto spoiler, elongate the cab and keep air off the tailgate. Add to that, the tailgate most likely sets higher in the air due to less weight on the rear springs, again more drag. The extra bed length alone is probably counts at least -1 MPG at that speed. This comparison is worthless on these points alone. Reminds me of my friend who bought a 2.0 EB 2015 Taurus thinking he would get better mileage than his wife’s 2015 V6 Epsilon Impala. How wrong he was. Turned out they both got identical highway mpg going at speeds in the 72-73 MPH range with the Ford actually getting lower city and combined than the 3.6 Chevy. They even traded vehicles for a few weeks and had similar results. I suspect this engine might do ok in a regular cab configuration used for in town deliveries. A business that serves inside the big city. As noted by others, the Colorado / Canyon twins might be a better utilization of this power plant. 2.7 L turbo is an engine for The Rocky Mountains. Above an elevation of 4300 feet it will make more power then the 5.3 L V8. Above an elevation of 8700 feet it will make more power than the 6.2 L. 5.3 L V8 is an Engine for you flatlanders. Another nail in General Motors CEO Mary Barra’s coffin as logic should have seen this blunder given the Silverado’s specifications and job requirement as the 3.0L DOHC-4v 4-cyl turbo simply needed to work too hard to gain any advantage over a Ecotec V6 or V8. Unfortunately, we all know the day is coming where V8 powered vehicles will be no more. What GM is doing is testing the waters with new tech to see what it will do, and what it won’t do. This engine is meant to be a pioneer into the world of smaller turbocharged engines. Once GM works this engine out and refines it, the 2.7L will do fine. I do see it being the base engine for the next generation Camaro along with a variant of the 3.6L twin turbo V6 as the new engine for the SS. I strongly believe that the next Gen Camaro will do away with all V8 engines, and a variant of the E-COPO Camaro’s electric drivetrain will power the next gen ZL1 in a fight with an all new Electric range topping mustang, and possibly something from Tesla as well as Dodge. The Z28 will return in a slightly hopped up form of the 3.6L Twin turbo with the 7-speed DCT transmission and a suspension and braking system set up as a hotter blend of track and street. The SS will have the 10-speed hybrid transmission plus a 7spd DCT a performance AWD, Brembo brakes, magnetic ride and a lot more tech and better visibility with more of the current 1LE baked into it and tech from the Cadillac ATS-V, the 2.7L Camaro will have a lot of the same 1LE baked into it but as the entry level car with better fuel economy. I also see this engine going in the Colorado, and the new blazer as I’m quite sure the Blazer will move to a RWD platform to compete with the explorer and I foresee a 3.0L 400hp twin turbo engine in the mix as well as the 3.6L twin turbo as both vehicles will fight to dethrone the Durango as the best midsize SUV on the road in terms of power and performance. I also foresee Chevrolet putting the Malibu on the upcoming VSS-R platform along with the Camaro and the Blazer and offering the 2.7L and the 3.6L Twin turbo in a trio, along with electric variants for each of them. The Malibu will carry the SS badging again with the 3.6L Twin Turbo V6 and 10-speed automatic with performance braking, suspension, aerodynamics, drive line, and styling. Chevy is going to follow in Ford’s footsteps, just like Ford is following in Dodge’s footsteps and go to two cars, a sports coupe and a sedan, the SUV market will include the current lineup except the Traverse will probably disappear in a few years as the Blazer will take over on the VSS-R platform. The Suburban will more than likely meet it’s demise as will the Impala while the Tahoe will live on to compete with the Expedition with the extended wheel base being the Tahoe XL (like the Denali or the Expedition L) GM will drop the engines down to a 3.6L Twin turbo V6, same as what they’re going to do with the Silverado and the Cadillac 3.0L will be used in the lineup as a mid level engine under a different name than the blackwing as the black wing will undoubtedly receive upgrades in the near future. Dont forget, the 3.6L Twin turbo V6 also had a 410hp variant in the CTS V-Sport and the XTS V-Sport and it’s torque out put was in the mid 400lb-ft range putting it on par with the 6.2L V8 in the Silverado currently. Tweaks to the turbo system along with a hybrid 10-speed auto could do wonders for it not only as a regular duty variant, but also as a high performance Silverado SS pushing just over 500hp and nearing 600lb-ft of torque. Not to mention we all know that Ford is planning not only an electric F150 but also a off road Super Duty which will probably have a diesel option and a twin turbo V6 option. I foresee GM doing a bit of the same. Not to mention the Ram HD now has a Cummins Diesel I-6 turbo that makes 1000lb-ft of torque. I could easily see Ford switching it’s Powerstroke to an I-6 Turbo diesel pumping out numbers near that along with GM doing the same for it’s Duramax. While unfortunately the V8 will no longer live on, I’m quite sure performance will live on as electric vehicles and hybrid automobiles become more common place in the market.